The Colosseum – How Is It Made? The symbol of the capital city par excellence and an architectural masterpiece of ancient Rome, the Colosseum is the most visited attraction of the city, with almost five million visitors a year. You can not, therefore, exclude it from your itinerary when you visit Rome, whether you come to the capital for a couple of days, or have a chance to stay longer. The Colosseum, we guarantee, will knock your socks off, both for its spectacular size (it is the largest Roman amphitheater in the world) and for the emotional impact that it will have on you (you cannot remain impassive in front of the the fact that the building represents a proof of the great cruelty and ferocity of ancient times). Since there are endless queues to visit this attraction, we suggest that you get the ticket on line, you will save time that could be spent by visiting the other wonders of the capital. But how was the Colosseum made? We provide below some news about the structure of what has become the model for all subsequent sports stadiums. In the past they were entirely covered with travertine. They are divided into three levels of arches framed by pilasters (pillars embedded in the wall) with tuscan capitals (lower level), ionic capitals (middle level) and corinthians capitals (highest level). The arches of the middle and upper levels were embellished with statues, while the tallest part featuring windows and corinthian pilasters was characterized by the supports for the 240 pillars that supported the “velarium”, a huge retractable fabric tent covering the arena. On the ground floor there are 80 archway entrances (vomitoria), that allowed the spectators to enter and sit in a few minutes. Originally it had a wooden floor covered with sand in order to avoid that the gladiators could slip and in order to absorb the spilled blood. The arena could also be flooded during naval battles (naumachie). Thanks to some trapdoors it was possible to enter the underground spaces and underground passages that constituted the hypogeum. The “cavea”, the area reserved to spectators, was divided into three parts: the senators sat in the lower rows, rich people in the middle and the plebeians in the upper ones. The women, except the vestals, were relegated to the top sectors. As nowadays, the spectators had a numbered ticket pointing to a seat in a precise area. In front of the seating rows there was a large terrace (the podium), which was reserved to the emperor, the senators and other personalities of respect. The underground areas were situated under the whole structure and were used to store scenographies. It was the place where the naval battlegrounds scenographies were built, to be eventually lifted with a complex pulleys system. The gladiators reached the hypogeum directly from the adjoining school, whereas the fierce animals were brought from Mount Celio, where there was a “zoo” where the beasts were locked in cages built within the masonry. 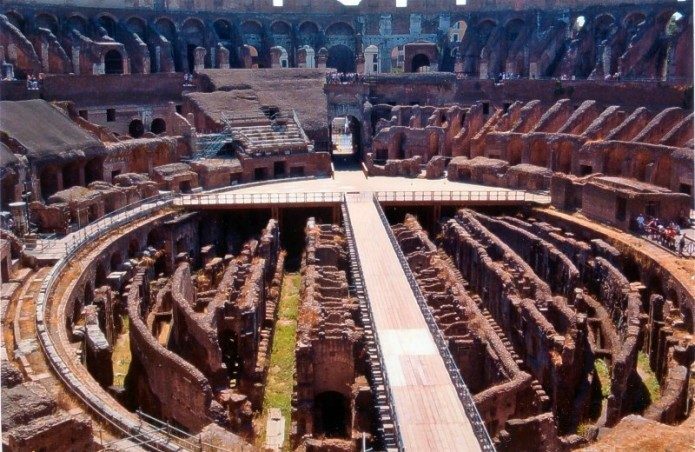 From there the animals were brought to the Colosseum by using a goods lift.